Ama Dablam Expedition-climbing Ama Dablam-Ama Dablam 6812m. An expedition to Ama Dablam is more than just a climb. It’s a journey into the heart of the Himalayas. Located in the Khumbu valley of Nepal, only 12 km from the summit of Mount Everest, Ama Dablam expedition demands the attention of every passer-by. Soaring ridgelines and super-steep faces guard the summit from all but the experienced climber. From the summit you are surrounded by a vista of peaks like no other, five of the highest six peaks in the world are clearly visible. From the summit of Ama Dablam 6812 M.
The first ascent (via the SW ridge) of Ama Dablam expedition was not made until the mid-60 by a strong NZ/USA team. The north ridge fell to a talented French team as late as 1979. In recent years many parties have successfully climbed the mountain, with nearly all ascents via the original SW ridge route. Our ascent will be made via the conventional SW ridge route, a technical route that requires 3500m of fixed ropes and four camps above base camp. Ama Dablam climbing can often be completed easily in less than four weeks; however, we do build in an extra week in case of exceptionally bad weather. Ama Dablam climbing on the route involves pure rock climbing on exquisite granite followed by mixed snow and rock climbing. The last section to the summit involves ice climbing followed by a long steep snow slope: often ropes are employed all the way to the summit. The reasons for this are three-fold: safety, speed, and success. Due to the technical nature of the route, ropes will be fixed for most of the climb above camp one. Although we can brush-up your skills at Ama Dablam base camp, a good working knowledge of abseiling and use of mechanical ascenders (jumars) is mandatory: prior experience is required. This might involve a couple of weekend sessions at your local cliff or bridge. Objective danger on the SW Ridge route is minimal, ice cliffs do not threaten it, the snow slopes are generally stable (with minimal avalanche risk), the rock is of good quality and the mountain is below the reach of jet stream winds. Ama Dablam expedition route is extremely exposed and mistakes with rope work can be unforgiving. For this reason, we have a low client: guide ratio and use experienced guides to keep you safely on track. We also have a strong local climbing Sherpa team to help us on the mountain. The Sherpas are the key to success. They carry and assemble our tents, fix much of the rope and supply each camp with food, stoves and gas cylinders. Without the aid of Sherpas, the chances of success are diminished and all your hard work can be wasted. Often the Sherpas are able to stock camps with sleeping bags as well! This then allows each climber to focus on getting up the hill. Your guide(s) will be involved in the fixing of rope and the smooth running of the expedition but their primary concerns are client safety, service and success. Your guide will be climbing with you at all times, often assisted by a climbing Sherpa. Your guide and Sherpa will ensure your safety and make decisions regarding safety and weather. Your guides perform cooking and other camp duties. This allows you to rest and enjoy your surroundings at each of the camps. You are then left to carry only your personal gear between camps. We have exceptional food in base camp and on the mountain. Our tents are all high mountains quality and roomy enough to enable you to enjoy a comfortable night’s sleep. If you want the best chance of success– this is it! 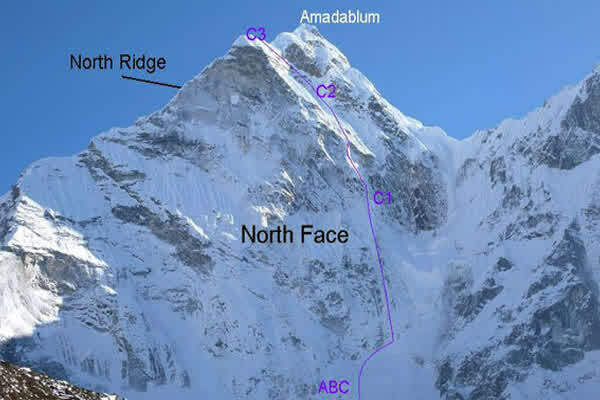 We provide the highest quality commercial operation available on Ama Dablam. A scenic Twin otter flight to Lukla (2800m), gateway to the highest peak on earth, Everest. Climb one of the most technical and beautiful mountains of Nepal, Mt. Ama Dablam. Close view of the Himalayan giants - Mt Everest, Lhotse, Makalu, Cho-Oyu, Kanchenjunga, Chamlang, Baruntse, and many more. Mt. Ama Dablam trek and climb is accessible to experienced climbers. Ama Dablam Expedition is one of the best climbing with rock and ice mix. The climbing on the route involves pure rock climbing on exquisite granite followed by mixed snow and rock climbing. The last section to the summit involves ice climbing followed by a long steep snow slope up to the summit. 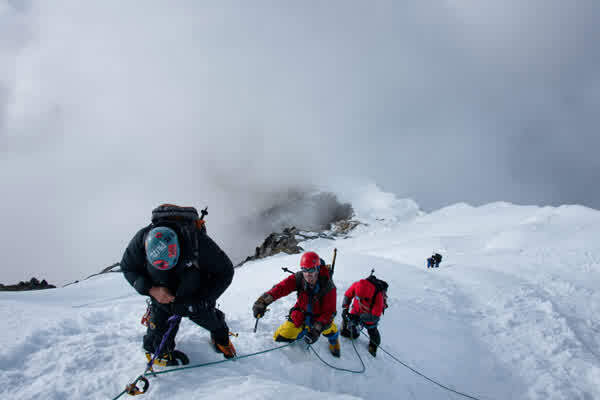 Crampons are used for maximum grip, and harnesses and ropes are used for maximum safety. Previous snow and ice climbing experience are essential. The south-west ridge route requires technical climbing over rock, snow, and ice. Even though the route will mostly be fixed, you should be familiar and confident mixed climbing. We have developed an itinerary (longer than many other operators) that should enable all members of the team to safely reach the summit and complete the trip in good spirits! You will need to be able to walk for 4-8 hours a day with a daypack. Depending on your general level of fitness you may benefit from a training regime in the lead up to the trek. This trip introduces you to high altitude trekking. A spirit of adventure and a willingness to stretch your horizons are what you'll need. Some experience of hiking will be an advantage. Autumn season (Sept-Nov) being the best season for climbing peaks, offers excellent weather and tantalizing mountain views, and also the best season for peak climbing. Recommended season for Climbing Ama Dablam. Summer months (June-September) of the year which coincides with monsoon begins in mid-June and drains in mid-September making travel wet and warm. The mountain views may not be at their best as rain clouds and haze overhang the mountains occasionally obscuring the enchanting views. These times are blessed for the keen botanist as the higher valleys and meadows blossom with flowers and lush vegetation. 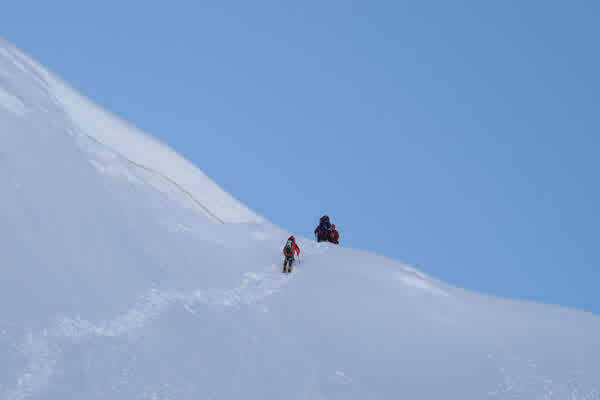 Spring season (March-May) is the expedition season and the best time for climbing the high peaks. It is mildly warm at lower elevations but occasional haze mars the beautiful view of mountains. At higher elevations over 4,000 meters, the mountain views are excellent and the temperature is quite moderate even at night. Recommended season for Makalu Expedition. Winter season (December-February) is noted for cold weather with occasional snowfall at higher elevations. Again, excellent views are common. These months are popular and ideal for trekking for those who are well equipped or who remain at lower elevations below 3,000 meters. Most of the hotel owners will come to the lower altitude cities like Kathmandu and Pokhara. Although Travel in Nepal can be organized throughout the year, October through May is considered to be the best months for trekking. Upon your arrival at the Tribhawn International airport, Kathmandu our representative from Alfresco Adventure Travel wait for you outside at Arrival gate with your Name card. Our team will welcome and collect your baggage at the airport. By formal introduction with the representative and transferred to your hotel. In the evening you will enjoy complimentary welcome dinner in a typical Nepali restaurant with Nepalese cuisine. Overnight at hotel. After early morning breakfast, we have sightseeing tour around Kathmandu Valley. Kathmandu valley is well known as living museum, art and cultural hub of the ancient historical city. We visit Swayambhunath Stupa. Swayambhunath stupa is popularly known as monkey temple, which is isolated on a hilltop in Kathmandu and is also one of the famous historical and religious site for both Hindus and Buddhist community. It provides excellent views of the Kathmandu valley. Then we drive to Boudhanath stupa, which is one of the largest stupas in the world and one of the important religious site for Buddhist around the world. Finally, we drive at Pashupatinath Temple is the biggest temple of lord Shiva in south Asia. It is a close distance from Boudhanath Stupa and located at the bank of holy Bagmati River. Pashupatinath Temple is the ultimate pilgrim site for Hindus throughout the world. All those three sites were listed in UNESCO World Heritage sites. Overnight at hotel. From Phakding the trail follows the Dudh Koshi River and reaches Zamphuti. From there we can see excellent views of Thamserku peak. Then the trail climbs to Chomoa, the site of an agricultural project, an interesting place to have a look around and gain an insight into the farming way of life of these people. From Chomoa, the trail again climbs to Monjo (2840m.) and enters the Sagarmatha (Everest) National Park (1148 sq. km, established in 1976). Walking some distance uphill you will be at Jorsale (2830m.) and after a long climb with views of Mt. Everest peeking over the ridge of Nuptse (7879m.) the trail reaches the street of Namche Bazaar. Stay at Guest house- Lunch, Dinner and Breakfast. Overnight hotel at Namche Bazaar. To help with our acclimatization, we will spend a second night in Namche. During our second day here we will go to the Sagarmatha National park where we get our first views of Mt. Everest, Lhotse and Ama Dablam. After lunch we hike up to Kumjung to see the famous "Yeti" skull and the gompa then to Khunde to see the Hillary Hospital. Overnight at Guesthouse. The trek follows the gradual trail with few short up and downs overlooking magnificent view of the great giant snow peaks; Everest, Nuptse, Lhotse, Ama Dablam and Thamserku. After few hours of steady uphill hike, you’ll reach the most anticipated destination, Tengboche. The monastery located at Tengboche s the highest in Nepal, and is holds a special place for the Sherpas living in the Khumbu region. If you arrive here in Autumn, you may even get to witness the Mani Rimdu festival. Dingboche is a next village from Tengboche. Passing through the typical Sherpa villages like Pangboche and Shomare, you reach Dingboche in a matter of few hours. Today, you have a shorter day. After breakfast, you head further east and walk 2-3 hrs. uphill to reach the Chhukung village. You can spend the rest of the day here and prepare for the climb next day. It’s important that you acclimatize and grasp much knowledge about the weather, snow and climbing skills. Today, you head upwards, passing besides the Lhotse Glacier. A zig-zag route through the Imja and Lhotse glacier moraines leads to a wide valley flanking the south western side of the Island peak. You’ll reach the Island peak base camp and rest overnight. It’s a Big Day. Summit days are always overwhelming. You start early, probably around 2 am and start climbing up. This is not difficult but there are several short rock steps to climb before you emerge on the right side of the gully. The route then follows a ridge line, which leads to an exhilarating and exposed traverse onto the snout of the summit glacier. A guide will fix the rope and assist your for climbing. The final ascent isn’t much difficult and provides an exciting feeling. You can spend some time at the top a return back the same way. The day ends at the Base Camp. An extra day is kept to ensure you summit the peak if you are unable to do so the first day. Pangboche is a small Sherpa village located close to Tengboche. You will trek down and again up after crossing the river. It takes couples of hour to reach Pangboche before the dark. Today is the rest day. You will prepare for the climb. The Ama Dablam base camp from Pangboche is closer. 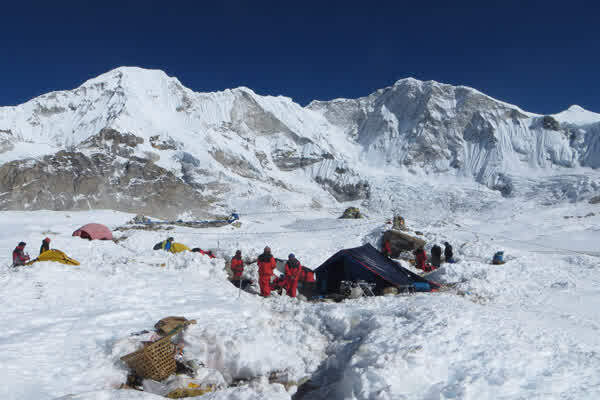 You will reach the base camp early and start preparing for the climb next day. Your Sherpa guide will assist you with all the information. The 12 days’ time period is kept solely for the expedition, including spare day. The overnight is arranged in a tent throughout the expedition, along with necessary staffs, gears and equipment. You will trek from Ama Dablam to Pangboche after completing the expedition. As you’ll be coming down, it’ll be easier. From Pangboche, you head back down the same trail towards Namche Bazaar. Even though, you don’t reach the base camp, the magnificent view of Everest will be visible through the journey. You spend the night at the Namche along with other trekkers. You can take the earliest possible flight back to Kathmandu. One of our representative will transfer you to your hotel. Later the evening, we will treat you with a complimentary dinner, a set of exquisite Nepalese cuisines.